How you will get money from to pay for this. It is for a time period (eg a term or a year), and is based on what you know when you make the estimates. So for a choir, it shows how much it will cost to run the choir (eg pay the musical director, hire the rehearsal hall, etc) vs how much money the choir will make from membership fees, performance fees, etc. This makes it is a tool which you can use to decide whether you can afford to run the choir the way you would like to, or whether you need to change your plans so it either costs less or raises more money. Based on 2), make lists of likely costs of running the choir and ways that you will get money. Make an educated guess about how much the actual costs will be: This is your budgeted-expenditure. Make an educated guess about how much money you will get will be: This is your budgeted-income. Calculate budgeted-income MINUS budgeted-expenditure. 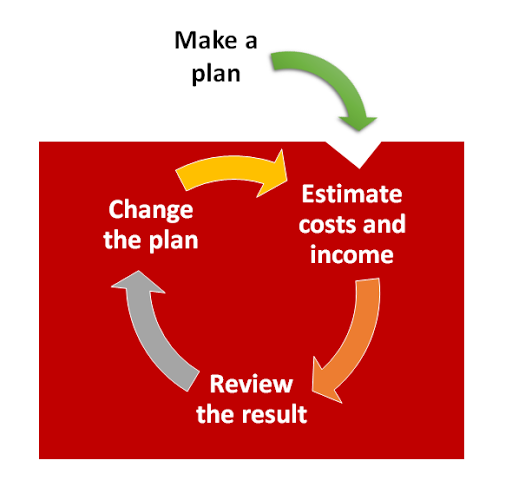 If the result is negative, ie you are likely to spend more money thank you have, then return to step 2 and revise your plans. Keep working through steps 2-6 until you have a plan that everyone who is involved is happy to work with. The Choir Budgeting Template is an Excel file that helps with the sums behind your budget or financial plan. 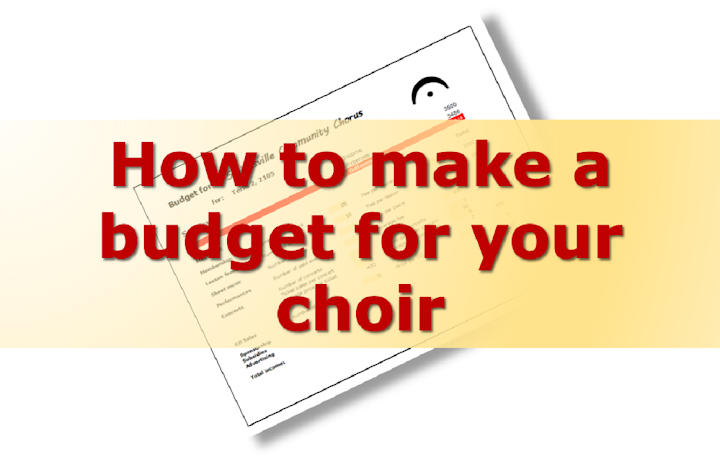 It has spaces for the typical costs and ways that choirs get money, and helps you to work through a first budget. Downloading the file to your computer. Add any extra rows that you need. Work through each section in the template, filling in the cells which are light yellow shaded with numbers that are relevant for your choir and how you plan to operate. Add in any categories that you need for either money coming in (income) and going out (expenditure). Make sure that you calculate the totals for these, and that they are included in the overall totals. Generally, it's best not to remove categories that don't apply to you at the moment: it can be a helpful reminder to know that your choir had very cheap hall rental or an accompanist who does not get paid - because losing these supports may totally change the budget for your choir. Go through the budgeting process (steps 2-6 above) as many times as you need to, until you have a plan that you are happy with. Some people make a budget at a certain time (eg the start of the year), and never look at it again. Wiser people make time every so often (eg once a month or once a quarter) to review their budget, and see how if the estimates changed based on what they have found out, so far. How often you should do this depends on what type of choir you have, and what the consequences would be if you make a loss. For example, you may have estimated that hiring a hall will cost $100 per month, but half way through the year the rent may have been unexpectedly increased. Revising the budget simply means working through steps 2-6 again, thinking about how things have changed and what you need to do about that. If your choir is very new, then you will not really know how many members you will get until you start. In this case, there is a risk that things won't work out the way that you estimate. Some people get a small grant (eg from the local / arts council) to cover the initial costs: if the choir is successful they this money can be used to pay for a future activity, and if it's not, then at least the fixed costs can be paid for a short time.